Our beautiful Cretan House set in the beautiful countryside of Mavrikiano overlooking the breathtaking views of the Mirabello Bay would be a perfect choice of holiday for our guests. Villa Bougainvillea is set in its own private grounds and is equipped with everything to make our guests happy and offer hassle free holidays. From Villa Bougainvillea is a 400 metre walk to the local shops, taverna’s, blue flag beaches and sea in the local village of Elounda. Beyond Elounda is the unspoilt fishing village of Plaka from where you can take a boat trip to the island of Spinalonga used as a leper colony up to 1957. Also on your doorstep is the lively harbour of Agios Nikolaos which boasts both excellent restaurants, tavernas along with sophisticated shops and waterside cafés. We can arrange luxury taxi transfers to and from the airport along with flexible car hire at competitive rates. The property was spotless, beautifully furnished and equipped with everything we needed for a comfortable stay. Eagle Car hire from the airport, arranged by Sharron, went smoothly, and the rep went out of his way to help us, escorting us right to the door of the villa. The views from the villa are truly spectacular in all weathers. We were very late in the season (end Oct) but there were still plenty of tavernas and restaurants open down in Elounda. A special mention goes to the Hope Taverna just down the road for its lovely views, warm welcome and good food. We had a great time exploring the local area on foot, driving through the mountain villages, and going further afield visiting Knossos and the archaelogical museum in Heraklion (wow! not to be missed), and the south coast of Crete. Sharron, the property owner, was available via email or phone to help us throughout and Kenny was also on hand locally should any practical problems occur (they didn't). All in all a really enjoyable holiday. Thank you Sharron. Just returned from a superb week staying at Villa Bouganvilliea. Myself, hubby, Mum and Dad throughly enjoyed our stay in what is a beautiful home, with spectacular views you would never get tired of looking at. The home itself is finished to a very high standard, very clean with great facilities including the lovely pool and BBQ area. Location wise - there are some great local tavernas down the hill only 5 mins walk and you can walk into the town centre in approx 15 mins. It is abit of a uphill walk on return from the village but worthwhile for the views and after all the holiday food and drink it's good to get a little exercise in. Our host, Sharron, was amazingly helpful from start to finish. Supporting us making travel arrangements, to making reccomendations on where to eat and drink right through to helping us get in a few shopping essentials for the fridge on arrival. The villa is beautifully perched up on a sizable hill overlooking the bay, islands, and sea off of the east coast of Crete. Its location is a true advantage. You can walk to Elounda in 10 minutes where you have lots of restaurants, shops, grocery stores, etc. We used our car only to travel outside of Elounda. Yet you are in a quiet area, with local flavor and residents, and spectacular views. Only the bathrooms do not have a view, and both bedrooms have balconies. Plus there is a roomy terrace with the pool, a dining table and lounge area. The villa itself is very well appointed and super clean. We loved the amenities and the ability to be outside so much with the pool. Communication with Sharron was top notch. She even arranged for a cab to take us to the Ferry Station in Heraklion, with an early pick up, and we could not have asked for better service. The individuals we met who care for the villa are British and very friendly and helpful. We really enjoyed any conversation we had with them. There is a lovely taverna, The Hope, which is a couple minutes from the villa. We ate there twice and loved it. The couple running this small restaurant are delightful, the view from their terrace is great, and the food was excellent. We always focused on their specials. We also recommend taking a short drive to Plaka to see a sleepy old fishing village and taking the Boat to Spinalonga to see the old Venetian fort and learn of the days when it was a colony for lepers. For fine dinning meals we recommend Lotus Eaters in Elounda and Taverna Paliria in Plaka. Service in all of the restaurants is excellent. We enjoyed the food in all the places we visited. The Greeks know how to serve with joy. Thank you so much Karen for such a fantastic review, very complimentary. We work very hard to please our guests which clearly pays off. You have been wonderful guests, we hope to welcome you back sometime. Sharron the owner of this villa is a real gem. She arranged a taxi from the airport and we felt like royalty as the taxi was an E class Mercedes and the driver offered us each a chilled bottle of water. The villa is not huge but you spend most of your time outdoors. The pool is bigger than it looks in the photos and the view is superb. We had a problem with the fridge and Sharron arranged for a new one within 24 hours which was amazingly good service. The walk down to the sea was very enjoyable and we were glad we had not rented a car. We walked into Elounda most days and enjoyed talking to the locals as we made our way through the beautiful village. The owners of The Hope Taverna (about 5mins walk away) are really friendly and we ended up eating there every other night, enjoying the various specials. After staying in Mavrikiano I don't think I would ever stay in the town again. There is a really lovely village atmosphere and you really do feel you have stepped back in time. The only negative I would mention is that it would be great if the was more shade to eat breakfast and lunch. A little pergola would make all the difference in the world. All in all a wonderful experience. Thank you so much Sharron. We enjoyed a lot our stay in this house. You will find there everything you need and the small city of Elounda is very close, even for a walk along the sea. The owner is very helpfull and will answer all your questions very quickly. This is the second time we have stayed in Villa Bougainvillea, and it was just as lovely as last year. 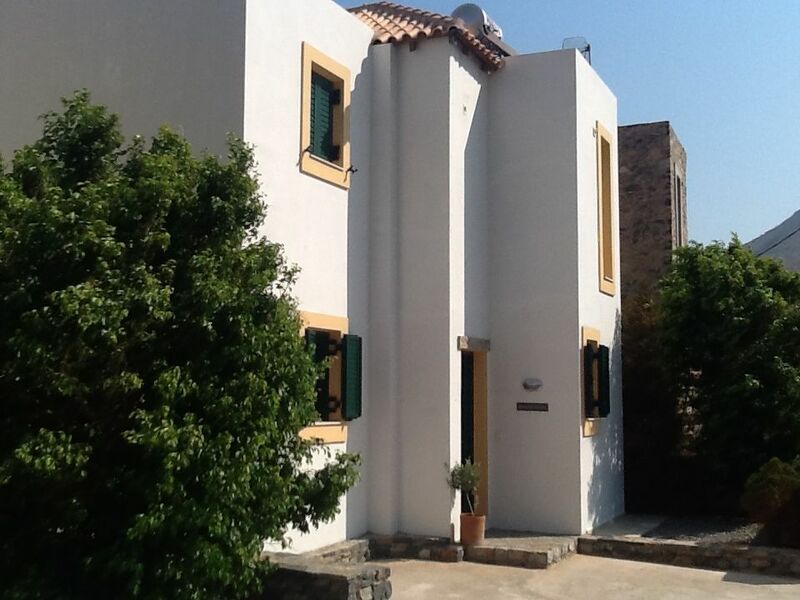 It is in an ideal position (as long as you can cope with a fairly steep uphill walk), overlooking Elounda and the bay. The villa is spotlessly clean (thanks to Lynn, John and the team) and really well-equipped. The beds are comfortable and the kitchen has everything you need. Wifi access was problem-free. The pool is perfect (thanks to Richard for the regular upkeep) and the views are so wonderful that it is hard to drag yourself away, especially in the beautiful autumn sunshine that we enjoyed throughout our stay. There is a wide selection of tavernas in Elounda (about 10 minutes walk), but 3 of the best tavernas are close by in Mavrikiano itself (The Hope, Palio Kantouni and Despina). All three are in the top 10 on Trip Advisor, provide very good food and service and are well worth a visit. The Hope in particular has a young couple running it who provide friendly service and really tasty food - and as a bonus, there are once again wonderful views over the town and the bay. Sharron organised a taxi for us on arrival and car hire for the second part of our stay through Eagle Car Hire. Everything ran smoothly, as it did last year, and we are very grateful to Sharron for that. There is no need for a car to enjoy a relaxing stay at the villa, but it does enable you to get out and about to visit some of the spectacular Minoan sites (such as Lato and Gournia) and visit some of the beautiful countryside and villages inland. If you are going to this area of Crete, there is no better place to stay than Sharron and Adrian's beautiful villa! Rob and Debbie thank you so much for such a lovely review. Totally agree we have a fantastic team that keep our Villa in tip top condition, they are a credit to us. Hopefully you will both return a third team, Elounda has definitely stole a little piece of your hearts. Villa Bouganvilliea, luxurious newly built Cretan Villa set in the small village of Mavrikiano, Elounda. Other nearby areas, Agios Nikolaous , Plaka, Loumas and Kritsa. Other Activities: Elounda is renowned and boasts excellent five star restaurants along with local taverna's in which serve excellent greek cuisine.